Boroughmuir coach Bruce Aitchison has warned his men to be on their guard in tonight’s BT Premiership clash with Heriot’s at Meggetland (kick-off 7.00pm) when top spot in the table will be up for grabs. The match was postponed from the opening day of season when the sides met at Murrayfield in the BT Charity Shield. The Goldenacre outfit took the honours that day, starting an unbeaten run which ended with defeat against Ayr last Saturday. Aitchison is bracing himself for a possible backlash. “Heriot’s will be tough and will be looking to return to winning ways after last week,” he said. Muir, now the Premiership’s only unbeaten side, have Ed Farquharson at full back for the unavailable Craig Marshall, while wingers Craig Hunter and Rik van Balkom start for the first time this season, and prop Craig Bachurzewski returns from injury. 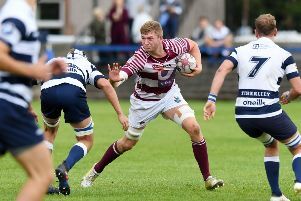 Heriot’s coach Phil Smith admits his players were frustrated by conceding two soft tries and a high penalty count last week. Max Learmonth replaces Charlie Simpson – a try scorer last week – who has work commitments, and Stuart Edwards starts at stand-off for the visitors. The crucial battle is likely to be the showdown between arguably the two best back rows in the league, with Muir featuring Zimbabwe internationalist Andy Rose, Edinburgh Rugby prospect Magnus Bradbury and Callum Reid, now back to his best after an injury that halted his progress a couple of seasons ago. The visitors have sevens international Struan Dewar, Jack Turley, who was involved with Edinburgh’s back up squad last season, and Jason Hill who is currently training with Glasgow Warriors. Meanwhile, Lasswade will also be in action tonight when they welcome Falkirk in BT National Division Two (7.30pm). In the weekend’s other game, Livingston host Irvine in a rearranged Division Three fixture kicking-off at 12.30pm tomorrow.